If you’re the type of cereal eater that wages a timely war on soggy cereal, consider the Obol bowl as a weapon in your ongoing war. The Obol compartmentalises the cereal and the milk, so you can keep the two tasty elements separate until the moment just before you combine and consume. Don’t get too cocky though, time isn’t completely defeated, you have to then factor in the stale cereal threat. The Obol bowl isn’t only for cereal of course, it’s for any time when two food tribes go to war – like corn chips and dip, or, for the US-inclined, biscuits and milk. It is food-safe, as in made of BPA-free polypropylene, and dishwasher-safe, and grip-friendly, with a keel-like base to hold or stand the Obol. The Obol bowl sells for US$19.99, and is available in 6 colours – white, green, orange, red, blue and pink. 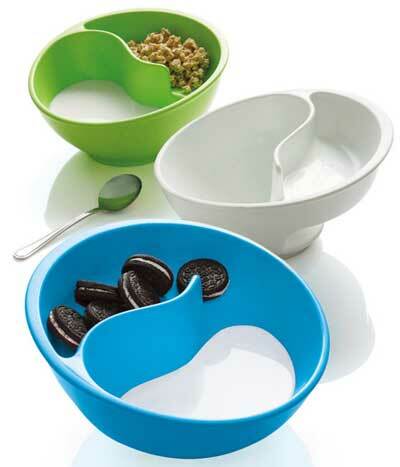 This is beyond awesome, wish I had this back in the day when I actually did have cereal for breakfast! Oh, you’ll have cereal again one day niece of mine. Cereal is the new black!